Keep it simple. Resist the urge for words. We know you have a lot to say, but no one is going to take the time to read a text-heavy email solicitation on Giving Tuesday. Share a concise, clean message with an easy call to action. Our client, The First Tee of the Triangle did a great job of this on the photo example shown here. Include a challenge. 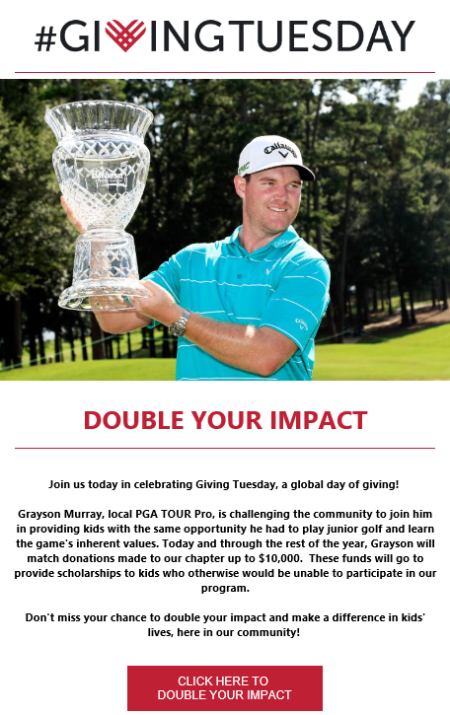 The First Tee example includes a matching gift that continues through year-end, a good incentive to give today or in the next few weeks. A recent study also suggested that challenges encouraging contributions from 3 out of 10 recipients of their request to result in making their goal are most often successful. Lead with a photo. Entice readers with a good photo before putting any print on the page. Donors heartstrings are pulled more by good photography than any words you can use to get their attention. Get a good button. Make sure your call to action is easy to find and functional by embedding a link to your giving page in a big, colorful button on your email. Finally, remember that "Giving Tuesday" doesn't have to be today. You can always select a day that is meaningful to your organization and make it your own giving day. CapDev client UNC School of the Arts does a great job of this by focusing on their founding date as a major solicitation opportunity for annual giving. One of their giving amount options is $19.65 for their founding year, 1965, an amount anyone would consider. Happy Giving to All Today - and Everyday!